The Black Knight is normally depicted as a villainous character, who uses his disguise for bad deeds. 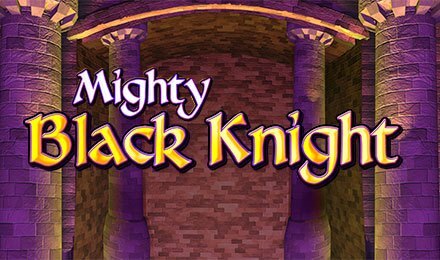 On Mighty Black Knight slot, you will come across one of them, where you will fight him to achieve your wins! This 5 reels and 50 paylines slot consists of symbols like: Spades, Hearts, Diamonds, Clubs, Maps, Ring, Orbs, Crowns, Kings and Queens to help you trigger wins! Launch at Wicked Jackpots Casino, where you could play on either your mobile, desktop or tablet! On the bet field, set your stakes using the plus or minus buttons on the Bet Field, then click on “Spin” to start your gameplay! Autoplay is available, and this allows you to set a sequence of automated spins to play hands free. Amount of Paylines Selection: All 50 paylines are fixed and cannot be changed. Coin Values: Stakes range from £0.10 to £250.00. The wild symbol takes form of the Black Knight, which replaces all other symbols except the scatter symbol. The scatter is the Mighty Back Knight Logo, which triggers the Free Spins Feature. Landing three, four or five scatter symbols anywhere on the reels triggers the Free Spins Feature. Receive 8, 12 or 20 free spins respectively. The feature takes place on another reel set where landing more scatter symbols will award extra spins. The Big Bet option is activated by toggling the “BB” game option. This consists of five linked spins, which are played with extra features. These bets are made at different stakes of £20, £30 and £50.